E-100 exposing units designed for the entry level market. This high quality machine is sold as a table top or with our new S-100-1 stand or utility cart. 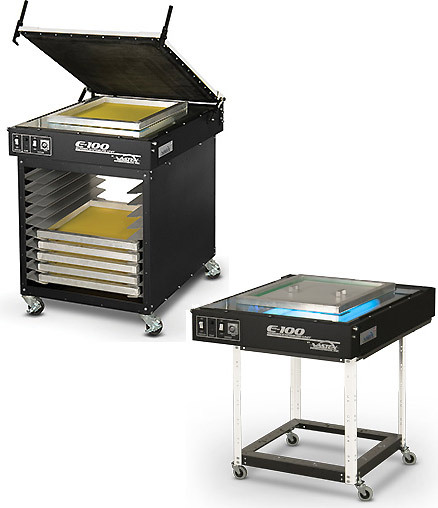 The utility cart is available with a light-tight door to store up to 11, ready-to-expose screens. To complete your shop, look at our V-1000 press, available with up to 4 stations and 6 colors, the F-Series, 18 in. (46 cm) sq. flash cure, and the DB-30, 120 volt 30 in. (76 cm) wide conveyor belt dryer. CAPACITY – 21 in. x 28 in. (53 x 70 cm) maximum screen O.D.